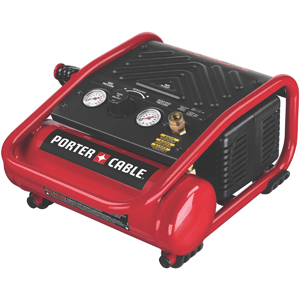 For those just looking for a simple, easy-to-use compressor for light duty projects around the house, the Porter-Cable C1010 may be just the ticket. 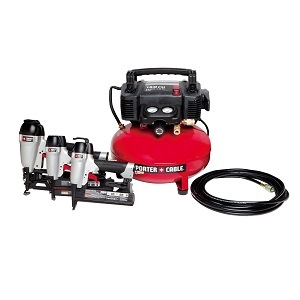 It's small, light, virtually maintenance free, and is one of the quieter air compressors available. The C1010 is a good little compressor as long as you understand its capabilities are fairly limited. Besides the glossy red paint, one of the first things you'll notice about the Porter-Cable C1010 is it's compact size. At just 9 inches tall and weighing in at only 23 pounds, it's extremely easy to carry around and put locations where some of the bigger, bulkier compressors can't go. The motor and 1 gallon air tank are well-protected by the included roll cage. For convenience, a built-in cord wrap is part of the package as is the single-handed universal quick connect. The C1010 is considered by many to be the identical twin of the popular DeWalt D55140. Let's face it, with on 0.75 CFM being pushed out at 90 PSI, high performance isn't this Porter-Cable's strong suit but that's not so important if you are using the compressor for its intended uses. You will have no problems with your brad or trim nailer but you'll be lucky to get 10 nails in if using a framing nailer. While the small tank is great for portability, it also means the compressor may at times be running constantly depending on the job. It takes about 20 seconds for the tank to refill. As with other small portable air compressors, the C1010 has an oil-less pump that requires no maintenance and will not cause any spills. Don't expect these types of pumps to have the same lifecycle as some of the heavier and more expensive compressors, but most users probably won't be using this compressor every day. Drawing only 2.6 amps, the motor is really easy to start, even for someone living in Minnesota in the winter. This is where the Porter-Cable C1010 excels. Rated at 71 decibels, it's one of the quieter compressors on the market. That noise level is comparable to someone using an old-fashioned typewriter. If you plan on running your air compressor indoors at times where rooms amplify the noise, you most likely don't want a loud unit. While you won't see anybody operating a grinder with this air compressor, it still has its uses. Using the C1010 with a finish nailer or brad nailer is a good combo and you shouldn't have any issues trimming windows and cabinets. Other uses include stapling, blowing saw dust off tools, inflating tires, and working with other small pneumatic tools. 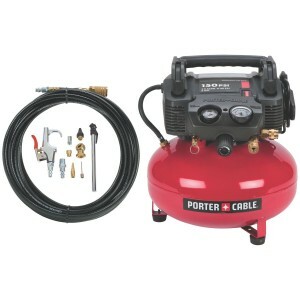 As a light-duty air compressor for home use, the Porter-Cable C1010 is a good choice for some. We would add another star to the rating if it had a slightly larger air tank. When you compare the Porter-Cable to its twin, the DeWalt D55140, you will find they look very similar and have almost identical specs but many people believe the DeWalt has a slightly better build quality. 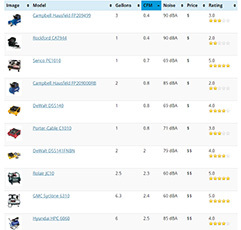 If you need more power at the expense of additional noise, you would be better off with the Bostitch CAP1512-OF which is almost the same price.